Athens, located in the north eastern portion of the state of Georgia, is a historic city with plenty to offer for anyone who wants to learn more about Georgia’s history. The city began as a trading settlement in the late 1700s and played a large roll as a supply center during the Civil War. Athens is now home to the Georgia State Botanical Gardens and the Georgia Museum of Art. Anyone spending a little time in this southern city has plenty of choices when it comes to selecting a new holistic dentist, even in the event of a dental emergency. The Emergencydentistsusa.com website is a superb location to begin your search for that new holistic dentist in Athens. Our convenient and hand-selected listing of Athens dentists provides you with all of the information that you need to make an informed decision about your dental health. Scroll through the list of Athens holistic dentists and click on the dentist with office hours or services that suit your needs. You will find information that includes driving directions, insurances accepted, and office hours right on the Emergencydentistsusa.com website. When you need a little more help choosing the right Athens holistic dentist for your dental emergency, or when you do not have access to the internet, our toll-free dentist finder hotline is always available. Just call the 24-hour dentist finder hotline and speak with a friendly agent who can help you pick a new dentist, can set up that first dental appointment, and offer you driving directions to help you get to your appointment. Remember to bring your dental insurance card, any necessary copayment, and your photo ID with you to that first visit. Arrive early to ensure that you have plenty of time to fill out the new patient paperwork. A variety of holistic dental offices in Athens means that you have lots of choices when it comes to treating your dental emergency. Scroll down to see three of our top Athens dental offices listed below. Description: Providing top quality preventive, general, cosmetic, and restorative care in Athens, Dr. Alex is known for his caring demeanor and his friendly staff. This full-service dental clinic has convenient office hours to suit your dental needs, and accepts a wide variety of dental insurances. Dental care with biocompatible materials is always on the agenda at Dr. Glenn Alex’s office. Description: Three caring dentists and a friendly office staff make this Athens holistic dental office a favorite in Georgia. From mercury-free fillings to low radiation digital x-rays, Mitchell Bridge Dental Associates provides holistic dentistry for all ages. Cosmetic dentistry, emergency services, and even restorative care are available through this Athens dental provider. Description: General dentists, dental surgeons, and a caring staff make Athens Family Dental Center a perfect location for your total dental care. This dental office works to build relationships that last, making your dental care their priority. Whole body health and your comfort are of the utmost importance at Athens Family Dental Center. Selecting a holistic dentist instead of choosing a standard general dentist means that you are taking an active role in your whole body health. Holistic dentists provide the same services as general dentists but they utilize materials that are biocompatible to minimize the impact on your body. From mercury-free fillings to low dose digital x-rays, holistic dentists use alternative methods to ensure that your dental wellness is a large part of your total health. A holistic dentist might also use office practices and materials that create a lowered impact on the environment, making the holistic dental office a “green” alternative to standard dental treatment. When the time comes to choose a new Athens holistic dentist, it is important to ensure that your dentist is properly licensed and credentialed in the state of Georgia. You can check for these licensing documents by accessing the Georgia Dental Association website and searching for your dentist via the simple search box. The Georgia Dental Association website offers current licensing documents for each dentist who is licensed to practice in the state of Georgia. You can also view these types of documents by visiting the dental office prior to your dental visit. 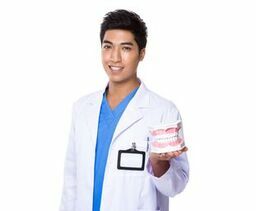 Just speak with the dental receptionist, and ask for your new dentist’s licensing information.